Preheat your oven to 350 degrees F. Line a baking sheet with parchment. On the baking sheet, lay the bacon slices side by side and transfer to the oven to bake for about 15 to 20 minutes, until the bacon is browned and crispy. Transfer to a bed of paper towels to drain. Dice up the bacon and set aside. Pour the bacon fat from the baking sheet into a small bowl and whisk in the red wine vinegar, Dijon mustard and salt. 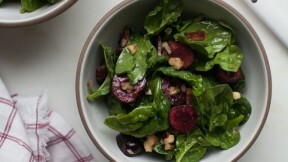 In a large bowl, add the spinach, cherries and walnuts. Pour the dressing atop and toss the salad until the leaves are thoroughly coated. Serve immediately.